“Lomography”, as it’s known, is both the name of a company and the genre of trendy toy camera film photography the company promotes. 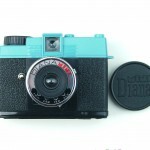 The original Diana was a 120 roll film plastic junky toy camera from Hong Kong which became popular among a certain niche. The current Diana is a little nicer quality, but still very cheap. 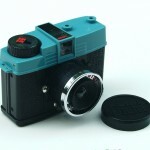 The Diana Mini is a 35mm version of the Diana. It has two masks in it, for square photos or for half-frame portraits. Two apertures, “sunny” and “cloudy”, and two shutter settings “instant” and “bulb”. You focus by guessing the distance to the subject and dialing it in on the front of the lens. The lens is made of plastic or cheap glass and the photos that result tend to be soft focus. By overexposing the film a bit to get good, dense negatives, you can achieve some beautiful images with a grainy, dreamy quality to them. This camera is tiny and fits in my pocket, and it weighs almost nothing. This was a gift from my mom, and while it’s considered a “toy” I have been pretty happy with it.